This 72-hour water vapor loop shows Florence's movement from Friday, Sept. 14 until Monday, Sept. 17, 2018. During that time, the storm, which made landfall as a Cat. 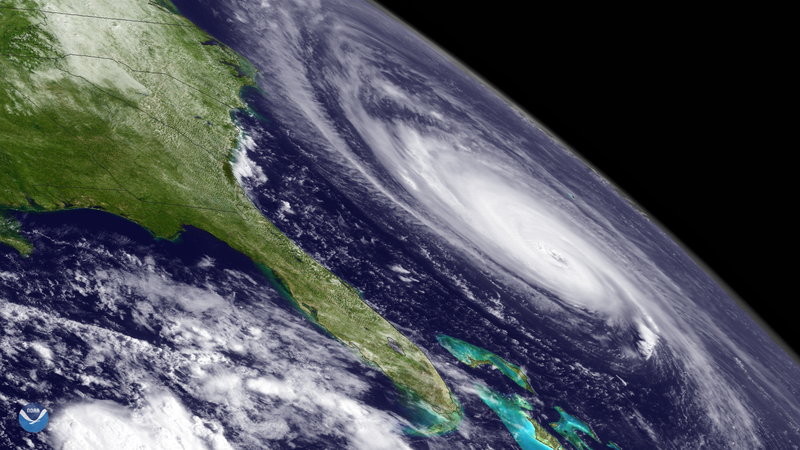 1 hurricane, brought catastrophic flooding to the Carolinas. 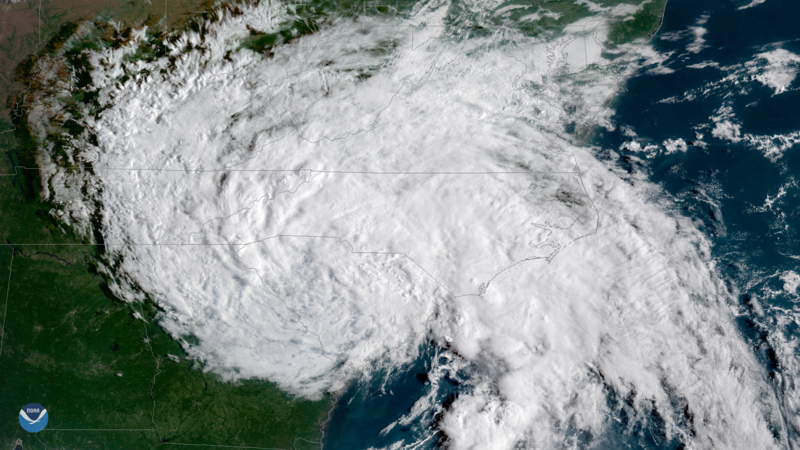 Florence, now a tropical depression with maximum sustained winds of 35 mph, continues to threaten portions of the Carolinas with flash flooding and major river flooding. This GOES East satellite image, seen at 8:45 a.m. ET on Sunday (Sept. 16), shows Florence still lingering over the Carolinas. 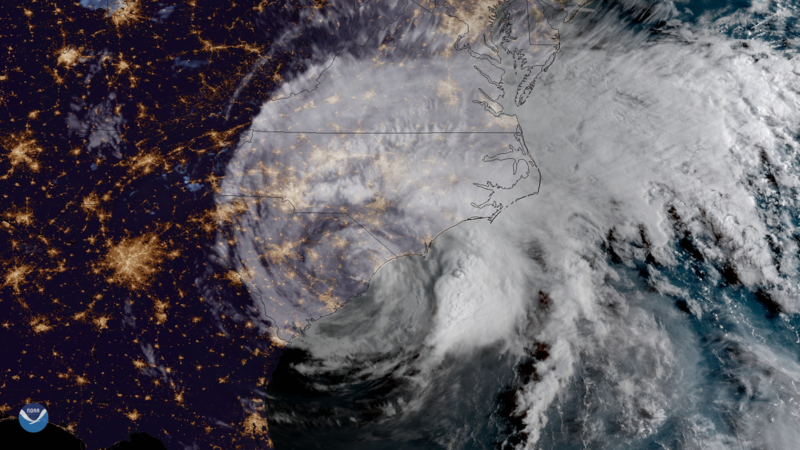 Hurricane Florence made landfall near Wrightsville Beach, N.C. at 7:15 a.m. ET. 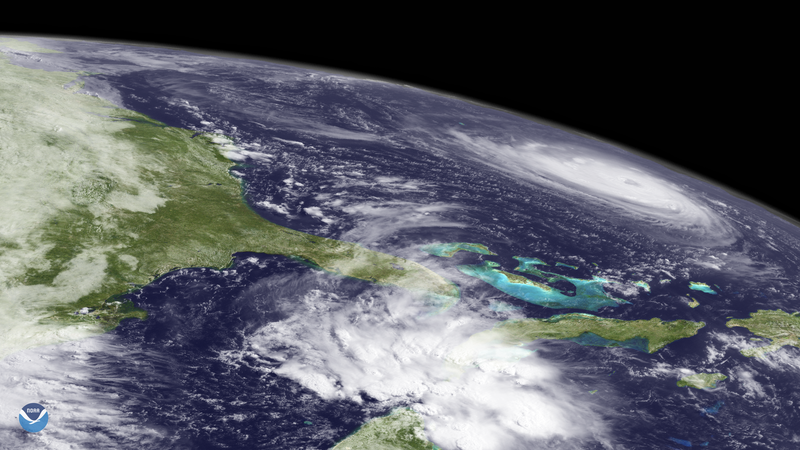 NOAA's GOES East satellite got a view of the Category 1 hurricane moving ashore this morning. 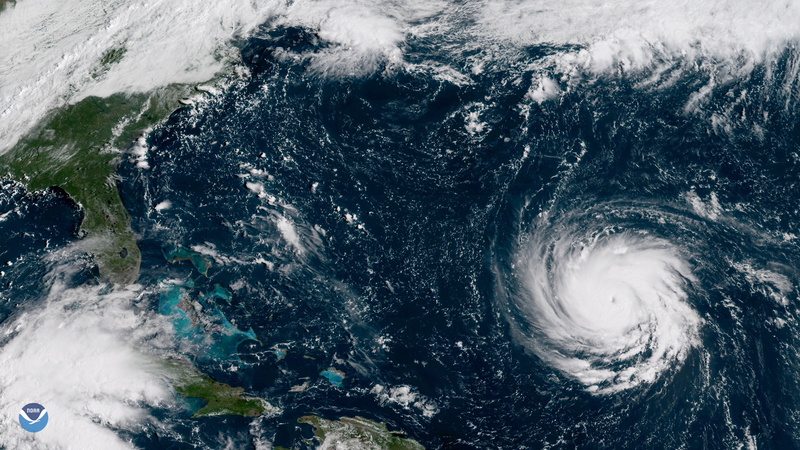 Forecasters with the National Hurricane Center warn that Florence will bring life-threatening storm surges and hurricane-force winds. "Catastrophic" freshwater flooding is also expected over parts of North and South Carolina. GOES East captured these two dramatic views of Hurricane Florence (above and below) shortly after the storm made landfall near Wrightsville Beach, N.C. on Friday, Sept. 14, 2018. Hurricane Florence continues to near the coast of the Southeast U.S., where it is expected to make landfall near the border of North and South Carolina on Friday morning (Sept. 14). The GOES East Geostationary Lightning Mapper captured this 3-day time lapse of all the lightning strikes in Hurricane Florence on its path toward the U.S. (Sept. 10-13, 2018). GOES East captured the sunrise over Hurricane Florence Thursday, Sept. 13, 2018, as the Category 2 storm moved closer to the coastline. The storm is currently located about 170 miles east-southeast of Wilmington, N.C. and moving northwest at 12 mph. Although wind speeds have decreased to 110 mph, Florence is still expected to bring life-threatening storm surge flooding and catastrophic flash flooding. 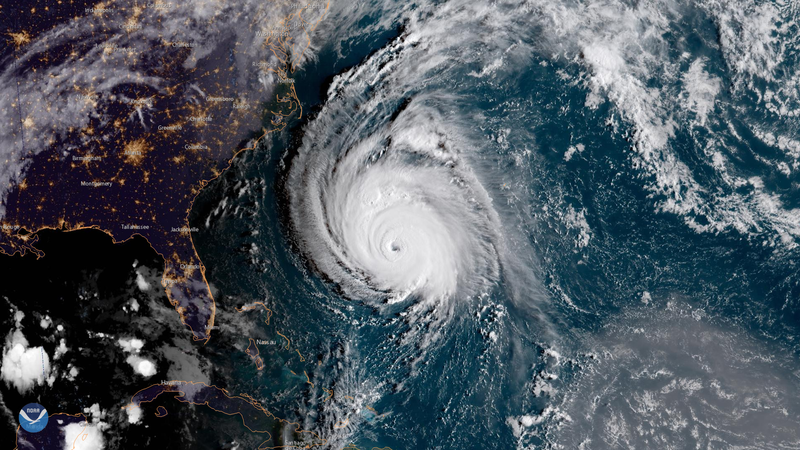 Hurricane Florence looks enormous, even from space. Here is dramatic view of the storm approaching the East Coast, seen from the GOES East satellite on the morning of Wednesday, Sept. 12, 2018. GOES East got another incredible view of Hurricane Florence on the afternoon of Sept. 12, 2018. This "sandwich loop" shows the storm through a combination of visible and infrared satellite imagery. GOES East captured this imagery of Hurricane Florence over the Atlantic around 7:45 a.m. EDT on Sept. 12, 2018. At this point, Florence was still a Category 4 hurricane with maximum sustained winds of 130 mph. 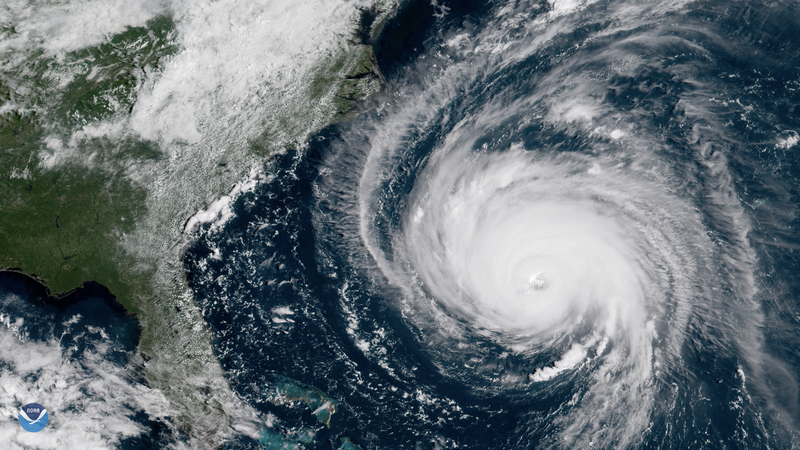 This alternate view of Hurricane Florence was captured by GOES-15 on Sept. 12, 2018. Hurricane Florence, still a dangerous Category 3 storm with 125 mph sustained winds, continues to move closer to the coast of the Southeastern U.S. 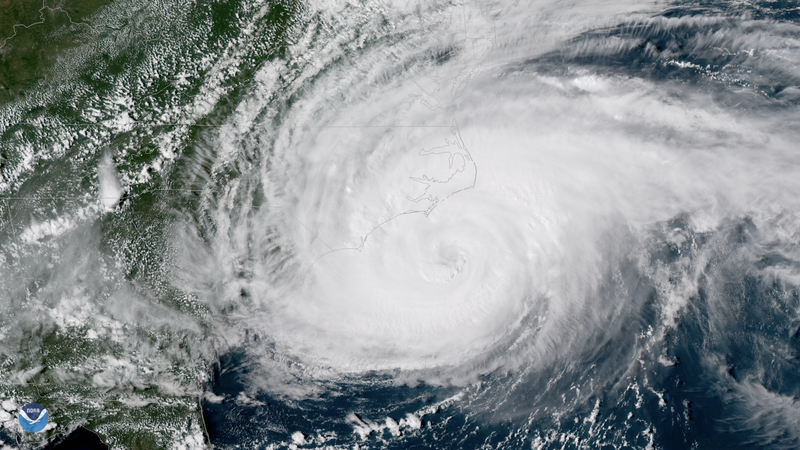 This geocolor image from NOAA's GOES East satellite shows Florence's well-defined eye and outermost cloud bands beginning to approach the Outer Banks at 10:45 a.m. ET on September 12. The center of the storm is expected to make landfall along the coast of the Carolinas early Friday morning. NOAA's GOES-15 satellite captured this limb view of Hurricane Florence churning through the western Atlantic Ocean at 10 a.m. ET on September 11, 2018. The latest update from the National Hurricane Center shows Florence moving west-northwest around 17 mph, with its forward speed expected to increase over the next 24-48 hours. As of 2 p.m. ET Tuesday, Florence was still a dangerous Category 4 hurricane with sustained winds near 130 mph, and hurricane-force winds extending 60 mph from the center of its circulation. Check out all the lightning activity in Hurricane Florence, Tropical Storm Isaac and Hurricane Helene, seen from the GOES East Geostationary Lightning Mapper (GLM) on the morning of Sept. 11, 2018. Here you can see the frequency, location and extent of lightning in each of the storms, and other parts of the western Atlantic basin. The GLM, which is the first operational lightning mapper flown in geostationary orbit, is capable of detecting in-cloud, cloud-to-cloud and cloud-to-ground lightning activity over the Americas and adjacent ocean regions. Data from the GLM helps forecasters understand when a storm is forming, intensifying and becoming more dangerous. Florence intensified to a Category 4 storm, with one-minute sustained winds of 130 mph. The GOES East satellite captured this view of the storm around midday (ET) on Sept. 10, 2018. GOES East 30-second visible imagery of major Hurricane Florence churning in the Atlantic Ocean on September 10, 2018 highlights the eyewall mesovortices in the storm. Rapid-scan imagery from GOES East has been instrumental in center fixing and getting a better characterization of the organization of tropical storms.